An Auckland artist whose work seeks to illuminate links between consumerism and waste has been named as this year’s recipient of the Fulbright-Wallace Arts Trust Award, and will undertake a three month residency at Headlands Center for the Arts near San Francisco. 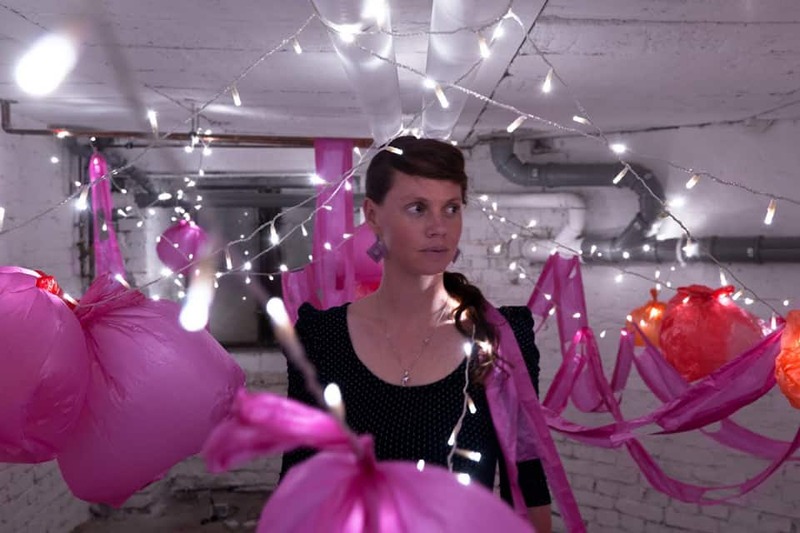 Brydee Rood is an installation, performance and video artist who uses items associated with consumption and waste – including LED fairy lights and brightly coloured rubbish bags – to draw attention to the materialism of modern societies. A recent example of Brydee’s attention-grabbing work is Müll Ballon Wolke Kanal-Projekt, in which she floated a manned, cloud-like vessel of inflated rubbish bags down a Berlin canal to the applause of ferry loads of tourists. It was a video of this live “intervention” which caught the eye of the Fulbright-Wallace Arts Trust Award selection panel, who selected Brydee to carry out new creative work on a similar theme in the United States. Brydee Rood graduated with a Master of Fine Arts degree in installation and sculptural practice from the University of Auckland’s Elam School of the Arts in 2007. She has previously been awarded residencies in Holland and Germany, and lived and worked in Mexico and Japan in addition to New Zealand. She has exhibited twice in the US before – in Miami and New York – but not spent significant time there. Brydee’s video work Müll Ballon Wolke Kanal-Projekt (2011) will be part of the exhibition of winners and selected finalists from this year’s 20th annual Wallace Art Awards, which is showing at the Pah Homestead TSB Bank Wallace Arts Centre in Auckland until 16 October, and then at The Dowse Art Museum in Lower Hutt from 29 October – 4 December. Fulbright New Zealand and the James Wallace Arts Trust partnered in 2009 to offer a joint annual award for an outstanding mid-career or senior New Zealand visual artist to work alongside American and other international artists-in-residence at Headlands Center for the Arts in the United States. Past recipients of the award were Richard Maloy and last year’s winner Mark Braunias, who is one of a dozen artists currently in residence at Headlands.